Glassman, Wyatt, Tuttle & Cox, P.C. shareholder Dale Tuttle has been included in the 22nd Edition of the Best Lawyers in America® for his work in Insurance Law. Many of Dale’s clients call on him to help with insurance coverage and insurance/reinsurance related disputes. 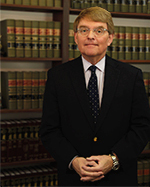 He has assisted in obtaining summary judgment decisions on behalf of his insurance law clients and insureds on a number of occasions, including through appeal to the Sixth Circuit Court of Appeals.